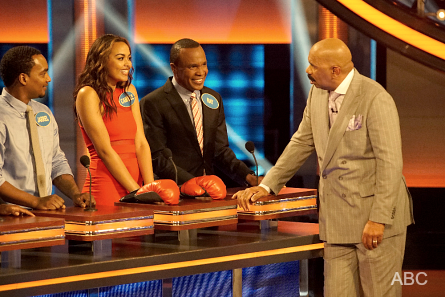 During a friendly family game of “Celebrity Family Feud”, it was the Broadus family (headed by Snoop Dogg) vs the Leonard family (head by Sugar Ray Leonard. The questions provided for some real comedy relief, especially during the final Fast Money round where a new term was invented! The first question of their game was to “name something that Grandma would do if she caught Grandpa smoking marijuana.” Snoop Dogg buzzed in first with “put hands on it”. Host Steve Harvey replied that the judges requested for him to be more specific. Snoop said “she would hit him.” It wasn’t on the board and the Ray family played. Ray said Grandma would “scream at him.” That was number two on the board. His son answered “pass it”. Everyone laughed, but it was actually number one on the board. With two answers left, the Ray family got three strikes and it went to the Broadus family. 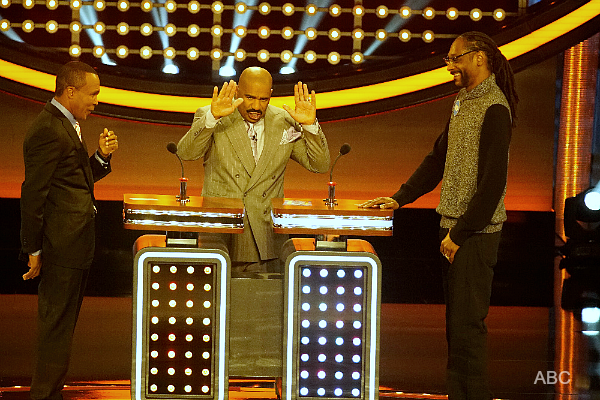 They answered “sell it” Snoop said he wanted to say “keep it.” That wasn’t there either. The two remaining answers were: “call the cops”, and “laugh”. The next question was “where were you the last time you let out an ear-piercing scream?” The Ray family played after they gave a correct answer of “roller coaster.” The next answer was also on the board “movie theater.” Sugar Ray answered “in the bed” and got a jaw-dropping surprised response from his daughter Camille who was standing next to him. Her answer was better – “car accident,” but, that wasn’t on the board either. The game went to the Broadus family. Their huddled answer was “at a sporting event” which was up on the board. The other answers included: Circus, School, and Delivery Room. The last question that would determine which family would be moving onto the final Fast Money round was “name a job you shouldn’t do if you’re afraid of heights.” The Ray family played for it. After there was only one answer left on the board, they answered “sky diver” which wasn’t there, the game went to the Broadus family where they got to play for $25,000 in the Fast Money round. The answer was “electrician/lineman”. 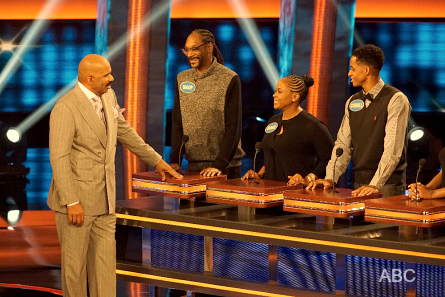 The Broadus family got to play for a chance to win $25,000 for the Snoop Football league. First up was Robin who scored 141 points. Then, Snoop Dogg was up next. When he got to the question “pie in the ____” he answered “horse”. His answer before that one what “April Fools Day” for “what occurs in April”, which was the number one answer. It scored them a total of 199 points, making it their total only one point short of the needed 200 points to win them the $25,000. Harvey replied to Snoop’s answer with “Pie in the WHAT?? !” Snoop said Pie in the Horse. Harvey exclaimed “the hell is he talkin’ about?” The answer received zero points. It was left to the last answer to the question, “name a color in a traffic light”. Snoop’s response was “red”. It was the number one answer and got them 57 more points along with the $25,000.